I am a big believer in making sure the kids understand maths concepts really thoroughly. We do lots of repetition but I try to find ways of doing the repetition in fun and creative ways so that the kids do not get bored. I try to include maths in crafts and activities, we make fun folding maths aids and I like buying the kids games which have maths angles. Some of the games the maths is more pattern concepts but in some games the maths is just straight forward basic addition. 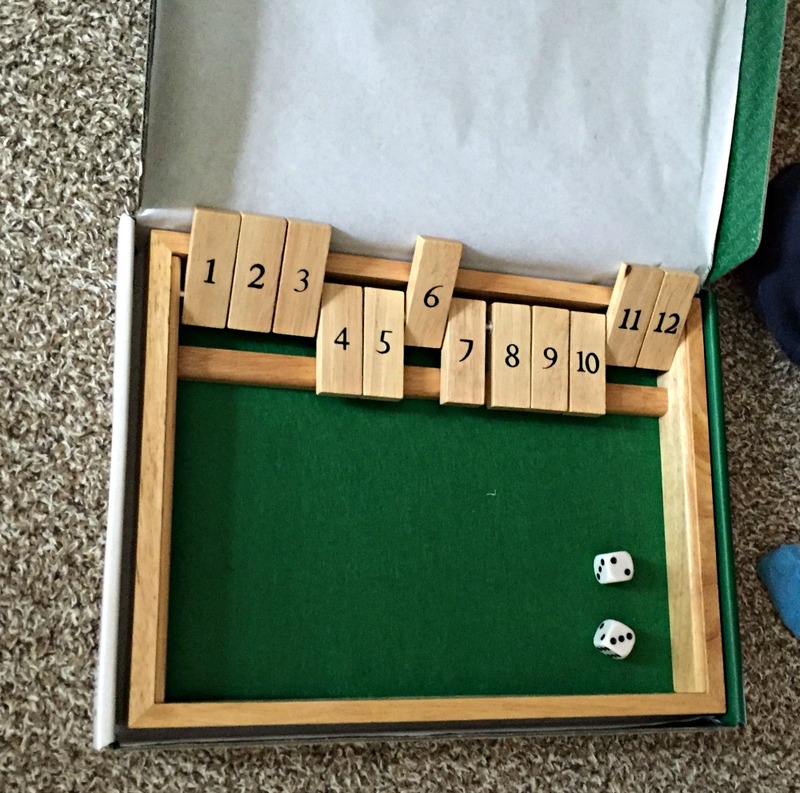 Shut The Box is one of those games, the kids are practicing sums, no frills added, no extra background story, just sums and my kids LOVE IT !! We were first introduced to this game by a friend and my daughter took to it very quickly, so after a quick search I found it on amazon and bought it (I have since also seen that John Lewis stocks it). I have seen two different versions of this game – one has flap with 0 to 9 –Toyrific Shut the Box and another has flaps with the numbers 1 to 12 – Wooden Shut the box 12 with wooden dice . We opted for the 1 to 12 version – this is a bit harder to find. The kids roll the dice and then flip the numbers 1-9 or 1-12 (depending on which version you have) to correspond to the total shown on the dice. If you get all the numbers down, you “shut the box” and win (we have actually never managed to get all the flaps down). Simple. Yes. But once you start the challenge can become a bit addictive. 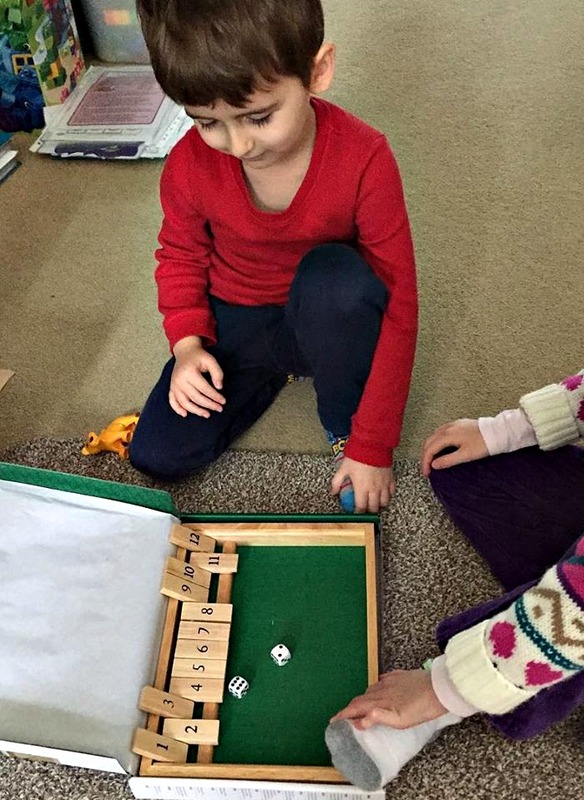 Both my kids really enjoyed the challenge and they have played it over and over and over and over…………… They played it together, taking turns to throw the dice and they also played it by themselves – like a challenge against the board to see if they can get all the numbers. My daughter will often get the game out and have a go by herself while her little brother is watching one of his dinosaur programs. It has been a big hit with both my kiddies (aged 5 and 7) and I love the fact that they are practicing their sums over and over again. Nothing required from me, they are practicing Maths as they play. Oh and just in case you are wondering – yes I too have had a few attempts (saying possibly more than just a few attempts) at this game and it does become addictive as you get slightly obsessed with tying to “SHUT THE BOX”. I bought this game for my kids to use and I can honestly say that I think it was worth it. 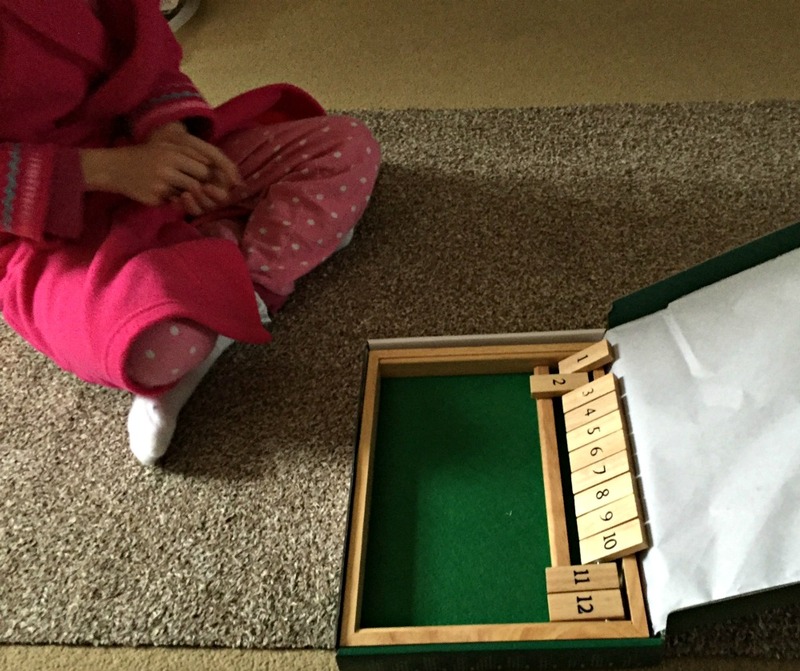 This entry was posted in Homeschooling and tagged educational games, hands on maths, home ed, home education, Maths games, Shut the box. Bookmark the permalink.